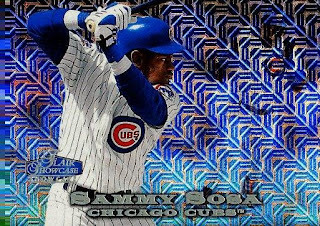 According to Yoel Adams of ESPN Deportes, former Chicago Cub Sammy Sosa plans to announce his formal retirement. Sosa has 609 career home runs, but so many of them could be tainted. During the race with Mark McGwire, America was glued to its TV sets, only to find out steroids fueled the crazy barrage of home runs. However, Sosa will not let steroids or performancing-enhancing drugs tarnish the game he brought back after the baseball strike. He just won't allow it. Is there any player out there who would have his type of numbers, yet not collected among the greats. You could get a nice autograph of his for around $40 on eBay. A 600-home run hitter for $40. Amazing. "Everything I achieved, I did it thanks to my perseverance, which is why I never had any long, difficult moments [as a baseball player]. If you have a bad day in baseball, and start thinking about it, you will have ten more," said Sosa. "I will calmly wait for my induction to the Baseball Hall of Fame. Don't I have the numbers to be inducted?" "I always played with love and responsibility and I assure you that I will not answer nor listen to rumors. If anything ugly comes up in the future, we will confront it immediately, but with all our strength because I will not allow anybody to tarnish what I did in the field," said Sosa. "The scandal on steroids and all those suspensions will not overshadow the game. Currently, there are many Latino players performing well [offensively]. There's [Albert] Pujols, Carlos Pena; Nelson Cruz has 15. Then what? There's someone else that already has 22 home runs [Adrian Gonzalez] ... we have hit and will continue to hit homers in the major leagues," added Sosa. Sammy doesn't get to dictate how his so-called "achievements" get perceived, by fans or HOF voters with backbones and a conscience. - He got caught with a corked bat in a game. - Circumstantial evidence of being a drug cheat is significant. - His sudden "no speaka ingles" routine in front of Congress was cowardly and disappointing. - His immediate power blackout once testing became regular is also very suspect. Sammy has some more explaining to do before he earns necessary credit to have what is considered an untainted career. Clearly, 600 homers doesn't mean nearly 10% of what it once did. If he or any of the other steroid guys ever make the Hall, they should have "syringe icons" on their plaques. I couldn't agree more with Todd Uncommon's comment. While I agree that the whole era is tainted, Sosa McGwire and Bonds are the worst of the worst as far as I'm concerned. I am so sick of all the BS-ing... When people get all high & mighty now, a decade too late to make a difference, when it is so easy and even cool to dump on the "steroid era" and virtually everyone in it. Even when someone is legit upset, it really just rings so completely hollow (not to mention pointless and redundant) to me. No offense Todd, but I am a fan with a backbone and a conscience. You may well be legit in your views, and I'm not saying you're right or wrong, I'm just tired of listening to people whine about it. Your comment smacks of just as much grandstanding bs as everyone else I've heard, fan and journalist alike, and it is THAT, not the steroid era or the performance enhancing drugs, which kills my love of the game.